BANGI, 19 Jan 2014 – Malaysia is close to achieving social cohesion despite unity among its various groups still being an elusive goal. The National University of Malaysia’s (UKM) Anthropologist and Director and founder of the Institute of Ethnic Studies (KITA), Distinguished Prof Datuk Dr Shamsul Amri Baharuddin said Malaysians needed to accept themselves as being a society of various cultures and religions in order to achieve unity. 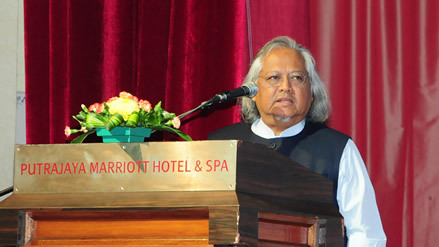 Delivering his keynote address on Unity, Cohesion and Integration: One Nation, Three Sacred Concepts at the two-day conference on Strengthening Nationhood: Sharing Experiences (COSMA3) organised by UKM here today, he remarked that social cohesion is not the same as unity where members of a society needed to have the same opinions on most issues. A group is said to be in a state of cohesion when its members possess bonds linking them to one another and to the group as a whole. That is unlike unity where even homogenous countries with one race and one religion cannot achieve. He said unity, social cohesion and integration are the three concepts that Malaysia is hoping to achieve. They are not the same but are linked. Unity is often expressed by the people and the nation’s politicians when talking about living in a multi-ethnic society but is actually just an ideal hope which has yet to be achieved. Unity is a goal to be achieved by a country with people of different races and religions, as in Malaysia. However, if even homogenous societies cannot achieve unity, it would even be more difficult for a heterogeneous country like Malaysia. Prof Shamsul Amri said that despite unity still not having been achieved, there is already a form of cohesion in the country. “Social cohesion is a condition that is not complete because Malaysia is a multi-cultural and multi-religious nation,” he said. Thus if we want to complete the cohesion to achieve unity we must accept our differences, otherwise it will not work,” he said. Prof Shamsul Amri said some people want to quantify unity but being something intangible, it cannot be measured though it can be monitored and compared. The two-day COSMA3 conference was launched by Minister in the Prime Minister’s department, Tan Sri Joseph Kurup. Some 40 academics from local public and private universities and an Indonesian institution presented their research papers at the conference.